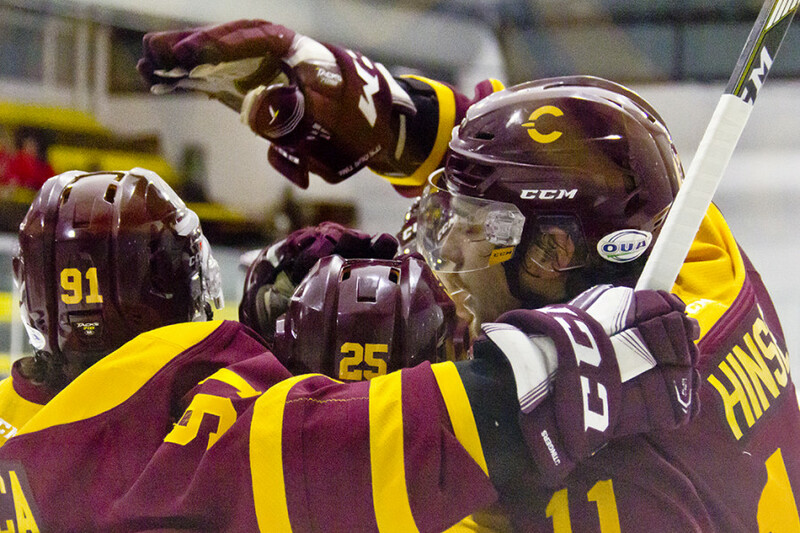 On paper, the Concordia Stingers men’s hockey team should dominate the University of Toronto’s Varsity Blues. While the latter toils at the bottom of USports with only one win out of 17 games, the Stingers are competing for the number one spot in the East Division of the Ontario University Athletics. Therefore, it came as a surprise to watch Marc-Andre Element’s team down by three goals at the end of the first period at Ed Meagher arena on Friday night. While the Stingers rallied to win the game 4-3 in regulation, it did look like the Varsity Blues were going to get their second win of the season and their first of 2017 for much of the first period. With only six shots on goal after 20 minutes of play, Toronto was opportunistic after second-year forward Aidan Wallace scored twice and then one from Ryan Kirkup. The Stingers, who led the first period in shots on goals 10-6, missed the net on several occasions and were defensively sloppy at times, often finding themselves behind the play. Newcomer and back-up goaltender Marc-Antoine Turcotte, who made his season debut against Royal Military College on Jan. 4 with a 7-1 victory, was pulled and replaced by Philippe Cadorette in the second period. However, both Element and Hinse defended the rookie goaltender. While Concordia took the first period off, it was Toronto who lost sight of their game plan in the second period, when the Stingers started putting more pressure on Varsity Blues’ goaltender Andrew Hunt. The home team capitalized on a power-play midway through the period when Anthony De Luca made a cross-ice pass to Philippe Sanche who shot a one-timer from the left face-off circle. While indiscipline hasn’t been much of an issue for the Stingers this season, Concordia took three penalties in the second period. Six-foot-three defenseman Mickael Beauregard, who is also a second-half addition to the team, was sent to the penalty box for charging with five minutes left in the period. However, the penalty kill benefitted Concordia. Second-year forward Charles-Eric Legare rushed down the left side, out skating Varsity Blues defenders as he came out in front of Hunt and defeated him glove side to reduce the goal gap to one. At 3-2, there was a clear momentum change on the ice. While Toronto fought back in the third period, trying to preserve their one-goal lead, Hinse ruined his opponent’s plans by scoring his 15th and 16th goals of the season. Now, two games back into the season, the fifth-year captain has five points in two games. After blowing their three-goal lead, Toronto’s head coach Darren Lowe acknowledged that special teams made the difference in the end. He also added that his team’s inability to play all three periods, which has been an issue for Toronto throughout season, was a factor in their loss. After facing off against the Western Division’s worst team, Concordia will have to switch gears as they are set to face the number one ranked team in that same division, the Ryerson Rams, on Saturday night. While the Stingers got away with only playing 40 minutes of the game, Hinse knows his team cannot afford to take any time off once the puck drops at 7:30 p.m. at Ed Meagher arena.